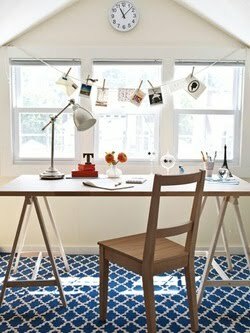 A very simple home office that you can create yourself. Seriously, this is one of those simple home offices that looks more expensive than it really is. A simple desk created with two stands and a counter top, all kept in the same material. A basic walnut chair fits with the room but maintains a slight distinguishable look. Add this with a bold graphic rug and neutral paint, plus a window view and you have yourself a serene office for conducting home business. The basic string for clipping pictures and postcards is a brilliant touch. Try it sometime.